Pope Francis received a delegation from the #Invulnerables project today. 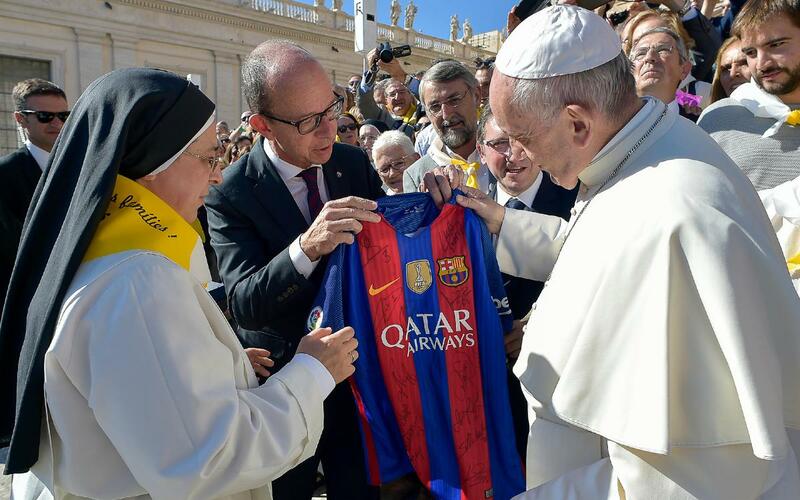 FC Barcelona and the Barça Foundation's vicepresident Jordi Cardoner was among those who travelled. Other members of the delegation were: Jaume Giró, director general of the Obra Social ”la Caixa”, Rosa Oriol Tous and Rosa Tous, president and honorary president of the Rosa Orial Foundation and sister Lucía Caram, promoter of the project, which is carried out in twelve Catalan cities. Furthermore, there were volunteers, beneficiaries and representatives of other companies and foundations who have backed the project. The group was accompanied by monsignor Sebastià Taltavull, auxiliary bishop of Barcelona, who is acquainted with the #Invulnerables project. The Pope conversed with the assembled group and heard of the strategies being used to guarantee equal opportunities and close the circle of poverty via an active participation of the whole society, both public and private. Jordi Cardoner, explained the challenges the Barça Foundation faces and the emphasis placed on transmitting values to youth through sport. The vicepresident headed the Barça delegation which also included director Pau Vilanova; patrons of the club's Foundation, Rosa M. Lleal, Enric Roca, Antonio Tombas; and the general director of the Barça Foundation, Mària Vallès. Sister Lucía Caram and Marc Simón, director of the Social Area of the Obra Social 'La Caixa', have promoted a house for infants, which will be constructed in the Monastery of Santa Clara Manresa and funded by 'La Caixa'. The projects objective is to defeat poverty with a special emphasis on the young and families who are vulnerable. It wants to become a tool to fight poverty and guarantee basic necessities such as a healthy diet, education, and encouraging young people to play sport. The project's participants are: FC Barcelona Foundation, Department for Social Welfare and Families, the Obra Social ”la Caixa” and the Rosa Oriol Foundation as well as local businesses.